FindItMore | Whether it is a bungalow or a multi-storied dwelling, it cannot be denied that a good residential roofing is a fundamental factor to ensuring the safety and well-being of the household. Regardless of the material of which the roof is made, the roof plays an extremely important role in protecting the interior of a house and keeps the occupants safe from violent weather conditions. However, since the roof is the most exposed part of the home, it cracks or fractures due to rough weather conditions and sweltering rays of the sun that can eventually lead to its failure during storms. When the roof fails or gets severe damages during a storm, it is extremely important to call in a professional roofing contractor to have it repaired immediately to ensure the safety and protect the inside of the home. But if the storm has not completely passed and the roofing contractor could not come and fix the roof right away, the next course of action to take is to install an emergency roofing. Emergency roofing is a necessary repair to make not only to protect the household, but also to avoid the damage from getting worse and cause more structural issues in the house. While installing emergency roofing is not, by all means, an easy task, knowing the basics of it is a duty of every homeowner, especially of those who live where hurricanes and tornadoes are a regular threat. In most cases, emergency roofing repair is done when shingles have ripped away from the roof due to strong wind and expose the substrate. However, an emergency roofing might also be necessary even without the presence of a strong weather event, such as when a tree limb falls off from a nearby tree and penetrates the structure. Other instances where an emergency roofing must be considered include the roof having sizable holes due to rotted wood caused by pests, or roof fire that have destroyed a portion of the house’s roofing system. Regardless of the cause of the damage, knowing how to install emergency roofing the right way can help the homeowner have peace of mind and even save money from additional repair costs. 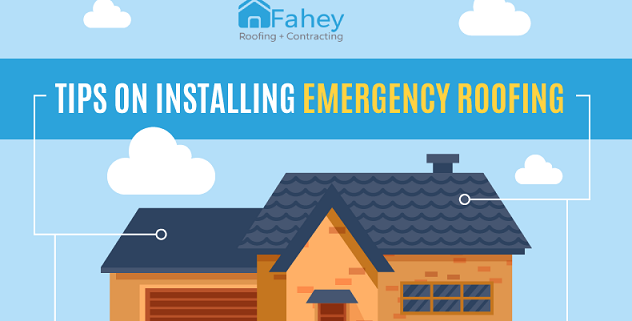 To give you an insight into the important things you need to remember when installing emergency roofing into your home, here are the key takeaways of the infographic below from Fahey Roofing Contractors. Check signs of water-related damages. Ensure your own safety before climbing the roof. Use roofing cement to stop leak temporarily. Release water in the ceiling to avoid collapse. Cover the damage with a tarpaulin or plastic sheet. To learn more on how you can execute these tips on installing emergency roofing, check out the infographic below. PREVIOUS POST Previous post: Why Choose Local Credit Unions Over Bank for Car Financing?